Rated 4.3 out of 5 stars.12 total votes. This lovely dining table will be the perfect addition to your casual contemporary home. The simply styled piece has a smooth oval shaped table top above sleek square tapered legs. So you can accommodate dinner guests. Cappuccino finish to complement your decor, and with different chair options to suit your taste, this table will complete your casual dining ensemble. Pair with any chair from this collection for a harmonious look that you will love. Wildon Home offers affordable, stylish solutions for nearly every space in the home. A diverse selection of well-made furniture is what sets Wildon Home apart from the competition. Their product line includes entertainment centers, home theater chairs, sofas, futons, bedroom sets, occasional/accent tables, and much more. Wildon Home furniture is a great addition to any home. When you buy a Wildon Home® Crawford Dining Table online from Wayfair, we make it as easy as possible for you to find out when your product will be delivered. Read customer reviews and common Questions and Answers for Wildon Home® Part #: CST1942 on this page. If you have any questions about your purchase or any other product for sale, our customer service representatives are available to help. Whether you just want to buy a Wildon Home® Crawford Dining Table or shop for your entire home, Wayfair has a zillion things home. Horrible table. It really is beautiful but it scratched easily over fifteen times within twelve hours of delivery. Six from the cat walking on it gingerly. We're going to get a tablecloth to cover all of the hideous scratches. Unless you want to refinish the table or get a tablecloth I suggest buying a different table. Such a shame because it's a beautiful table. My fiance and I had high hopes but now that we have the table we're extremely dissatisfied and will probably never purchase from Wayfair again. Nice table and matches perfectly with the chairs I bought previosly. Straightforward assembly. It is the exact color I was hoping for and assembly was very easy. Beautiful table and delivered with the utmost care! This table is great. The quality is really nice, and it was actually easy to put together! I keep the leaf in at all times to keep it as an oval table, but it would be great as a smaller circular table too. The table does show watermarks, but wiping it with a damp towel helps, and then once a week I use pledge on the whole table to protect it. I bought this with the wheatback chairs, and the whole set is beautiful. Love the table, just wish it didn't show the water marks. It features attractive tapered legs and made from rubberwood and wood veneer materials. With clean lines, stunning smooth top with molded edges and adaptability, there is no denying the versatility and style this table will bring to your dining room space. This dining table works well with contemporary, classic, or even industrial seating options. Its espresso finish enhances the versatility by working with any wall color and interior design. This dining table is built of selected wood and veneers to ensure lasting beauty. Because of its length, it is able to easily accommodate four people. 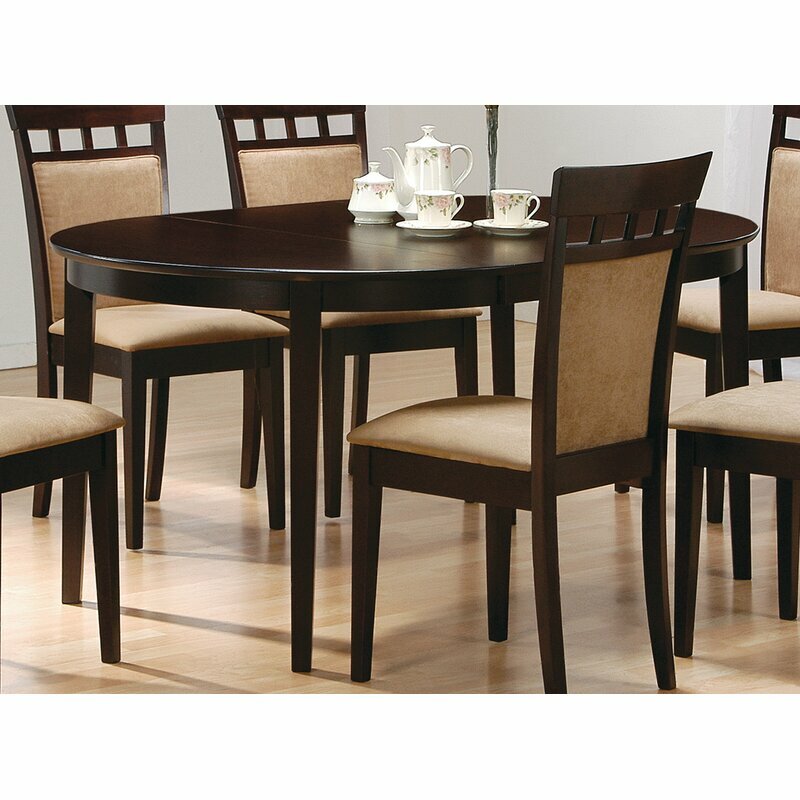 Perfect for a small dining room or kitchen nook, this cappuccino dining table features a classic silhouette. The rich and deep finish warms up even the most neutral of spaces. Fold up the table ends to accommodate for guests, or leave them down for a stunning cafe-inspired look. Straight and sleek, the smooth legs offer a clean aura. Decorate with a vase of flowers for a fresh feel. Guests not great at RSVPing? 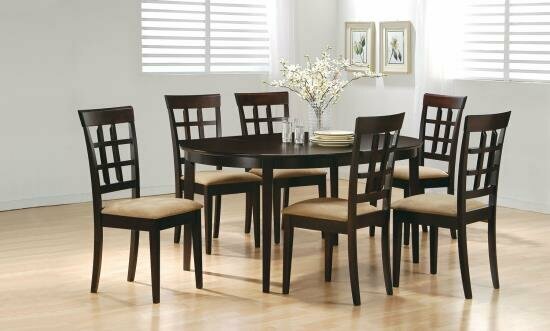 Fit a few extra friends in your entertainment ensemble at a moment’s notice with this versatile dining table. Crafted from solid rubberwood, this rectangular design features a butterfly leaf that allows this piece to extend up to 66" in length. Its clean lines give it a contemporary feel, while a two-toned neutral and cherry finish offers up a touch of countryside style. Assembly is required. The heart of your entertaining ensemble is your dining table. Not only is it the spot where you serve up dinner party courses and festive family feasts, but it sets the aesthetic tone for your room and allows you to stage centerpieces that are all your own. Just take a look at this one for example: crafted from solid and manufactured wood, it offers an understated appearance with four tapered legs and neutral finish. This causally elegant dining table is the unique conversation piece you are missing from your home. This unique dining table has a leaf so you can extend it to fit more of your friends and family. The coolest part about this table though, is the storage unit in the base. Store extra plates and silverware for easy access while you are eating. The rich finish brings sophisticated yet casual richness to your home. Dining in the outdoors brings to mind an open-air natural feel. This Casual Dining is a fresh approach to a casual rustic style. Two-tones finish with tops of the tables in driftwood. Tops feature a planked design with round/square peg accents. Tapered block legs carry the casual rustic theme of the group. Butterfly leaf square counter table has a pedestal storage base with a storage drawer and top shelving.